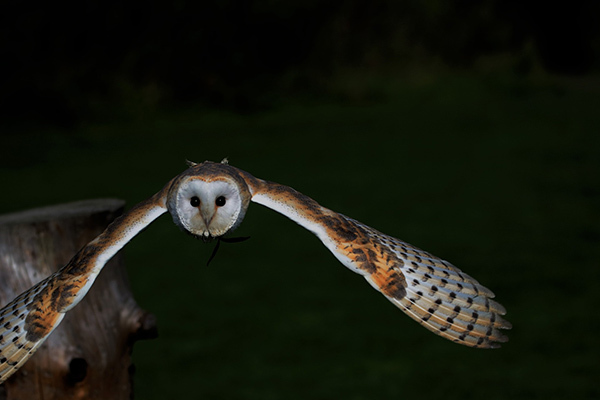 Ancient Greeks believed that the gods gave the owl a magical inner light, giving them the ability to see in the dark. To have an owl fly over an army before battle was a sign of impending victory. Halloween and owls have a long and storied history with each other. It’s thought that the connection may have been forged around ancient Halloween bonfires. As nocturnal hunters of bats, owls would often be seen in the light of the flames as they flew low, searching for food. Other reasons for the association between Halloween and owls include the birds’ preferred living quarters, which are in the hollows of trees where they cannot easily be seen; their cackling, witch-like screeches; their glow-in-the-dark eyes; and their unsettling ability to turn their heads almost 360 degrees. The birds also tend to scare nighttime travelers because of their capacity for silent flight. Just how silently they fly is nothing short of amazing. In fact, engineers have studied the mechanics of how they fly in the hopes of creating quieter aircraft. Today, of course, when we think of owls, we admire their suite of superpowers: beauty, precision hearing, incredible eyesight and night vision, and the valuable role they play in natural ecologies, keeping insect and rodent populations in check. Watch the video below from BBC Earth. You’ll see how the flight of Kensa, a barn owl, compares to that of a peregrine falcon and a pigeon when all three birds fly over a series of supersensitive microphones—and a floor of feathers. It’s almost scary how smooth and soundless a night-loving creature can be. Very interesting video and almost silent flight of owls. Fascinating video. Owls have always intrigued me.